Work > Come to Bed! Come to Bed! was a group exhibition curated by Roya Sachs featuring the works of three female artists, Michelle Jaffé, Marta Jovanović and Esmeralda Kosmatopoulos. Come To Bed! explored the theme of communication in the sphere of the bed, a lieu that hosts a third of our lives. The all female show focused on three sectors of communication that bring to play the different usages of the bed, from pillow talk, and self reflection, to technology with our need to stay connected. The installations reoriented ideas of time and space, by recreating the most intimate space of all, but in a gallery. By inviting three artists to each create their own intimate environment; we brang to life questions about the individual and the way in which we occupy the space. Performance artist Marta Jovanović’s Pillow Talk, was a long duration performance – lasting the entirety of the show, in which audience members are invited to get into bed with the artist, and have a one on one pillow talk with Jovanović about whatever their heart desires, for however long they choose. The concept alludes to the intimate secrecy that is shared during the act, but also referring to the ideas of revelation, as well as losing grip on reality. 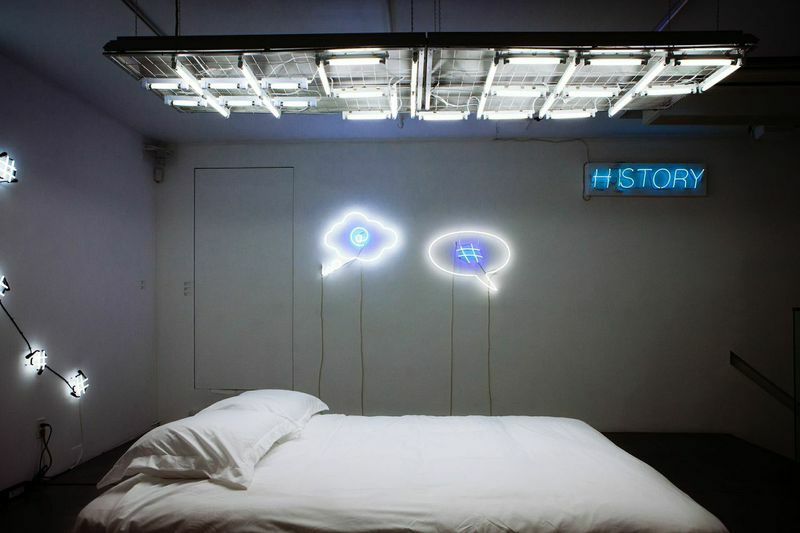 During the gallery hours when audience members are not in her bed, Jovanović continues her normal rhythm of life, working, eating, reading and watching TV in bed, all within the gallery space. After each pillow talk, she would write a word or sentence on her guests pillowcase, which they could then hang on the gallery walls. As the days passed, the walls got thicker and thicker, just as the weight of the information and secrets Jovanovic was told clouded her mind.